I thought it was high time that I wrote a few words about my greatest plant obsession-roses. I dream of roses- their voluptuous shapes, their heady scent, the way they add romance and nostalgia to any garden scheme. I only have to spot a rose in a border and I’m feverishly trampling over anything in my way just so that I can bury my nose in the soft folds of its petals and inhale slowly and deeply……..I call it the cocaine for the middle aged middle class woman! “Munstead Wood….there is a strong, warm and fruity Old Rose fragrance and notes of blackberry, blueberry and damson.” Mmmmmm. Even the names are seductive: ‘Lichfield Angel’, ‘Blythe Spirit’, ‘Gentle Hermione’. And who was ‘Madame Legras de St. Germain’ ( “Most beautiful and refined blooms of ivory- white tinged with yellow”) to have such a rose named after her? And I’m curious about the Gallica rose ‘Duchesse de Montebello’ ( “spreading growth, with a good fragrance and some of the fruitiness of a Bourbon”). Does this describe the Duchesse I wonder? Was she a bit fruity with the Duke? But I digress. 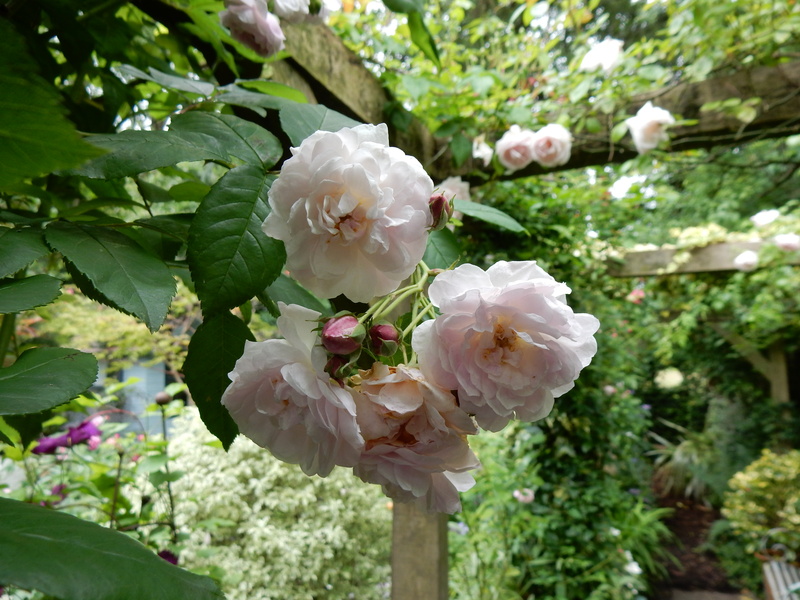 Seductive as these catalogue descriptions are, those of us with smaller gardens need to refine our choice using three main criteria, and look for those roses described as long flowering, scented and disease resistant. Harlow Carr- tough and healthy, I am training mine up a small crab apple tree. Graham Thomas- yellow, voted the world’s favourite rose- a fresh tea rose scent is lovely. Ferdinand Pichard- causes everyone to smile as it’s striped red and white like a raspberry ripple! Gorgeous scent too. Jacques Cartier- very tough and reliable, growing in less than full sun- delicious scent and perfect button centred flowers- love it! Felicia- an old Hybrid Musk rose, developed by the Reverand J. Pemberton in the 1920s when vicars didn’t have so much spiritual work to do presumably?! It flowers in huge clusters and the scent is given off freely into the air, so that you don’t have to bury your nose in it to get it. Divine! Crocus Rose- buds are soft apricot opening to cream. Looks wonderful in my white, cream and blue border. And a few climbers are useful too, although on short structures such as tripods, arches and to clothe the posts of pergolas I always use shrubs as they’ll climb to 6ft if tied to an upright, which is more than enough height.